The beard trend is still here in the D and everywhere we go! There are a few different ways to get your beard trimmed at our Hair Mechanix locations, depending on which type of beard you have. We love this Man’s Guide to Beards by: Real Men Real Style. 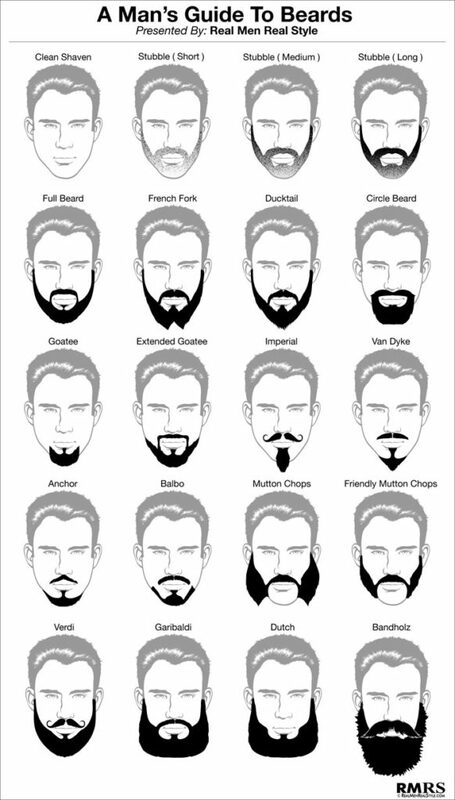 We see all of these different types of beards come through our local men’s hair salons. So if you don’t want to trim it yourself, let us do the beard trimming for you! on your head, it is better when it’s clean and without the oils when doing a trim. Try not to use a drying shampoo and use a clean towel to dry your beard. Comb it out – Depending on your beard type it may be easier to get an accurate trim by combing your beard first. Get Prepared to Trim that Beard – Be prepared with your; towel (we know your girlfriend can’t stand those beard trimmings all over! ), comb, scissors, clippers, mirror and styling products, if you have them. Check out our Grooming Products for Beards! Trim your Beard using Clippers – Make sure to use the appropriate size guard for the amount you would like to trim off. If your not sure, use the bigger guard first to make sure you do not trim too much off for your own liking. Trim your Beard using Scissors – You should probably let us do this, it takes skill in shaping and thinning the beard with scissors. But if you insist, make sure you are using a sharp pair of scissors made to cut hair like shears for barbers. Use a comb to guide you. Clean up your mess! – Remember that towel, thankful now aren’t you? You can also use newspaper on the floor. Be careful washing your clippings down the sink. It is best to throw them away so they don’t clog your sink. We use clippers and scissors at our shops depending on your beard style and what your preference is. So, if these steps don’t seem like something you want to do, or you try it and it doesn’t turn out how you want, as always we are here for your male maintenance! Find your local Hair Mechanix Men’s Hair Salon and let us trim that beard for you! Check out some beard styles trending this year.